'Part could have gone to many different racial backgrounds'. 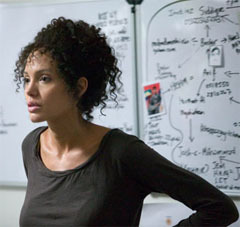 The casting of Angelina Jolie as Marianne Pearl, the wife of murdered journalist Daniel Pearl in the film A Mighty Heart has been the subject of many heated forum debates. In the face of death, Danny’s spirit of defiance and his unflinching belief in the power of journalism led Mariane to writeabout his disappearance, the intense effort to find him and his eventual murderer in her memoir A Mighty Heart: The BraveLife and Death of My Husband Danny Pearl. 'Six months pregnant when the ordeal began, she was carrying a son that Danny hoped to name Adam. She wrote the book to introduce Adam to the father he would never meet. Transcending religion, race and nationality, Mariane’s courageous desire to rise above the bitterness and hatred that continues to plague this post 9/11 world, serves as the purest expression of the joy of life she and Danny shared. One thing is certain casting Angelina in the part has generated the kind of publicity that will ensure the success of A Mighty Heart.